The Siena wall sconce by Tech Lighting is a simple and ultra-convenient way to convert virtually any Tech Lighting low-voltage Free Jack pendant into a wall sconce. The integrated telescoping arm accommodates any pendant up to 9” in diameter. Further enhancing this unique sconce tool is the integrated three step touch dimmer making it perfect for home or hospitality use. The Siena scales at 4.3”-5.6“ in width and 7.1” in length and is available in two on-trend finishes Antique Bronze and Satin Nickel. 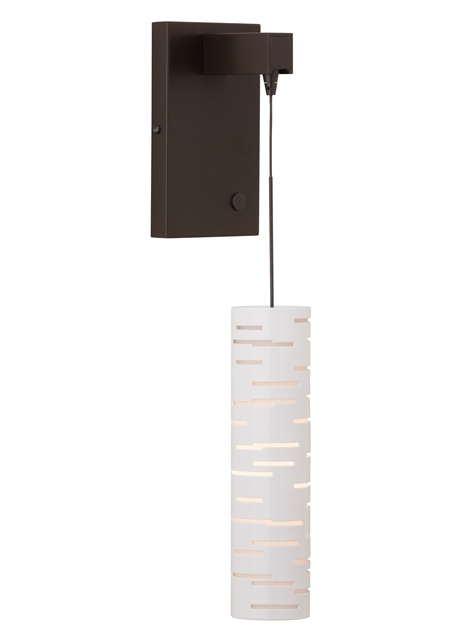 The integrated telescoping arm accommodates any pendant up to 9” in diameter. An Integrated two-way touch dimmer makes it perfect for home or hospitality use. Currently only compatible with halogen and xenon pendants, the Ensu (p.358 of Full Line Catalog) can be used with LED pendants. Can mount to either a 4" square electrical box with round plaster ring or an octagonal electrical box (not included). Includes low-voltage electronic transformer.